I’m in Wine Enthusiast this month!!! 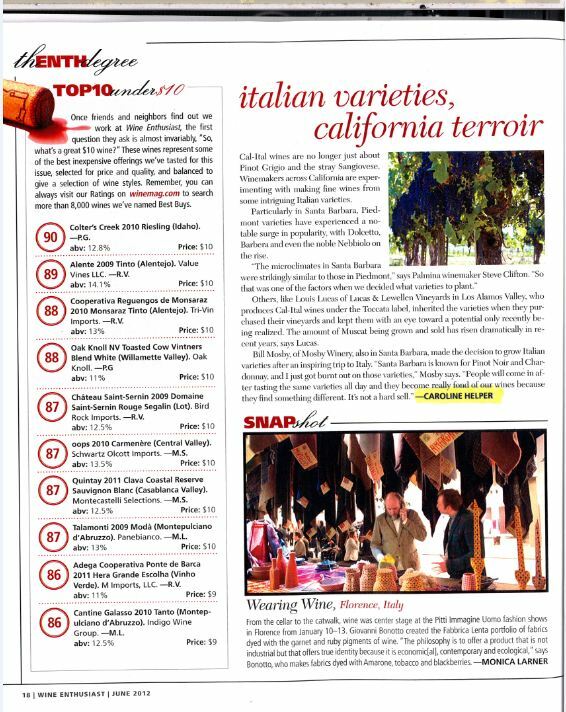 That’s right…your humble little blogger got an article in the June 2012 Issue of Wine Enthusiast! I’ve uploaded a picture for ya but if you’re so inclined, you should go get an issue and then write in to the editors to tell them how my piece was your favorite piece. Because, you know… you love me. The story is all about how there are some really cool winemakers in California using some interesting Italian Varieties. Of course, the story got significantly chopped and there are SO many great winemakers I interviewed and whose wines I sampled that didn’t make it into the piece. For them, I’ll be writing an in-depth roundup of the best of these new and interesting wines – so watch out for that in the next few days. Cheers!